Books make great gifts! Here are some of my top choices! Do you know someone who loves to cook? If so this one will be a hit! 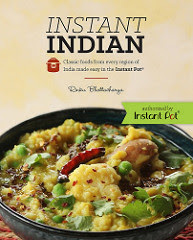 INSTANT INDIAN: Classic foods from every region of India made easy in the Instant Pot! I like that the recipes are not complicated! Rinku Bhattacharya is a Gourmand Award-winning cookbook author, blogger and cooking instructor. She is the author of Bengali Five Spices Chronicles and Spices & Seasons: Simple, Sustainable Indian Flavors. Rinku was born in Kolkata, India and has a natural passion and love for regional Indian cuisine and uses it to share and connect with her cultural heritage. She has traveled extensively and specializes in adapting Indian cuisine in global environments and kitchens. Her deep commitment to using seasonal ingredients for Indian cooking is reflected in her recipes. Rinku teaches very popular Indian cooking classes in the Hudson Valley area of New York and has been featured in newspapers, magazines and on radio. She and her family reside in the Hudson Valley area of New York. Visit her at www.SpiceChronicles.com. This next one is for those who would like to learn more about Bible Journaling! polish of the art, but in a deeper, more personal connection with God. bond? In this introduction to Bible journaling, you’ll discover meaningful ways to combine art, heart and scripture—from backgrounds to hand-lettered verses to beautiful full-page drawings. 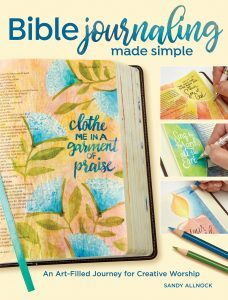 BIBLE JOURNALING MADE SIMPLE: An Art-Filled Journey for Creative Worship (North Light Books; October 2018; Paperback; $19.00) by Sandy Allnock states that no expensive supplies or artistic skills are required…only a desire to honor and enhance your spiritual life. In addition to the book a companion workbook BIBLE JOURNALING MADE SIMPLE: Creative Workbook (NorthLight Books; Paperback; October 2018; $19.00) is also available. If you like Bath Bombs and are the creative type this next book is a must-buy! 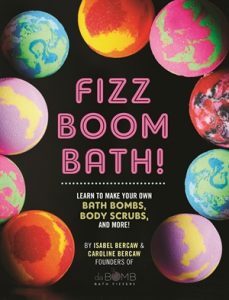 I absolutely love this book and it is simple to learn how to make Bath Bombs and Body Scrubs! My personal favorite is the “Meet Me in Tahiti” Bath Bomb! Growing up in Minneapolis, Isabel and Caroline Bercaw always loved using fizzing bath bombs. So much so that they decided to make some of their own. During the summer of 2011, their parents Ben and Kim picked up $25 worth of ingredients to make homemade bath bombs as a science experiment. They decided to create their own line of bath bombs that contain a fun surprise in the middle. After successfully launching the da Bomb Bath Fizzers at an art fair, they met demand by making each bomb by hand out of their basement. Flash forward to 2018 and Isabel, 16, and Caroline, 15, now run a multimillion dollar business selling over 500,000 bath bombs a month with 150 employees. And it’s become a real family business – their mom is the CEO, and dad is the CFO/COO. The da Bomb Bath Fizzers are sold in more than 7,000 stores in all 50 states. All the bombs are made in Minneapolis and they use local materials as much as possible. Despite their booming business, Isabel and Caroline are still full-time high school students and even compete on their high school track team. The “sisterpreneurs” truly embody the fun, fresh appeal of the business and always looking to learn more. 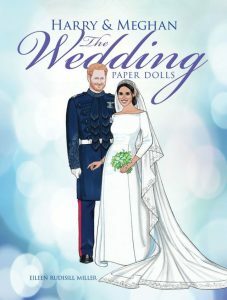 If you are a fan of Harry and Meghan then this next one is for you! Celebrate the royal wedding of Prince Harry and Meghan Markle with these lifelike cut-outs of the happy couple. Sixteen full-color plates include figures of the bride and groom, complete with accurate re-creations of the fashions they wore to pre-wedding events as well as on the day of the historic occasion. Highlights include the bridal gown, an exclusive design by Clare Waight Keller that was one of the year’s biggest fashion secrets and has already achieved iconic status. I actually am a big fan and love this book! Price: $9.99 and you can find here! Looking for an Inspirational story? 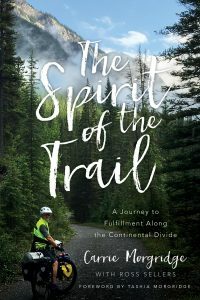 Check out The Spirit of the Trail by Carrie Morgridge! I really found Carrie Morgridge and her husband John’s journey very inspirational and interesting to read! 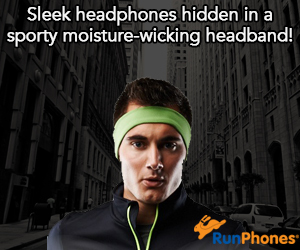 It’s also a positive story about how you can achieve anything. You can find it on Amazon. Do you have a Dog lover on your holiday shopping list? 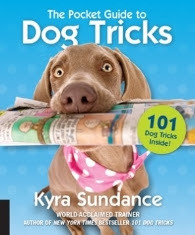 The Pocket Guide to Dog Tricks By Kyra Sundance is a must-buy! With all the instructions you’ll need to get your dog thinking, moving, and its tail wagging, this handy pocket guide offers step-by-step instruction for impromptu training sessions. I really like this book because it makes teaching y our dogs tricks very simple! Even kids will like this book so it is not only for adults! The Pocket Guide to Dog Tricks goes above and beyond in the most conveniently sized book for on-the-spot training. This book includes tricks ranging from basic skills like Sit, Shake Hands, Fetch, and Roll Over, to more out-of-the-box tricks like Tidy Up Your Toys into the Toybox and Get a Soda from the Fridge. Training your pup is important at any stage and helps increase your bond and communication skills for a better relationship and more energetic dog. Also, training on-site is not only convenient for you, but relevant for the dog to understand and remember a particular situation. With 500 images to show how to perform each trick step by step, The Pocket Guide to Dog Tricks provides easy to follow guidance for the best results. Perfect for traveling, a trip to the dog park, or to keep in your bag for immediate training, pup owners will love this book; and kids will too as a few of the best tricks from 101 Dog Tricks for Kids are added as a fun bonus! You can find this one on Amazon, Barnes & Noble and Target! Now here are some of my favorites for the Kids! 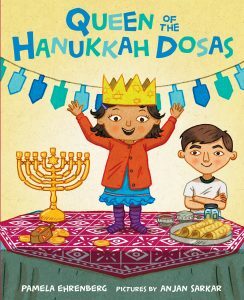 QUEEN OF THE HANUKKAH DOSAS by Pamela Ehrenberg; illustrated by Anjan Sarkar (Farrar, Straus and Giroux (BYR), October 10, 2017, Ages 4-7)This is a colorful picture book that blends Jewish and Indian traditions as a multicultural family comes together to celebrate Hanukkah in their own special way. QUEEN OF THE HANUKKAH DOSAS is a fresh, modern Hanukkah story with a dosa recipe in the backmatter. Big siblings will relate to the challenge of getting little sisters or brothers to behave in this sweet sibling story. I love gingerbread cookies and I really love this adorable story about this little Gingerbread Man finding his purpose! 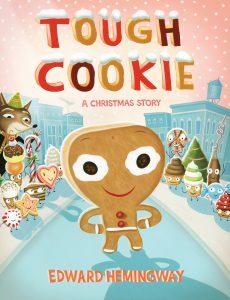 TOUGH COOKIE: A CHRISTMAS STORY by Edward Hemingway (Henry Holt and Co. BYR, September 11, 2018, Ages 4-8)From author and illustrator Edward Hemingway — grandson of the famous novelist Ernest Hemingway — comes a delightful picture book that puts a humorous new twist on the classic story of the Gingerbread Man. Once upon a time, while Fox was visiting the Land of Holiday Treats, a little cookie, still warm from the oven, burst out of the bakery door, looking sweet and delicious. But what happens when the little cookie, aka the Sugar Cookie Man, realizes he is not as fast and tasty as he thinks? A terrific gift for the holiday season! In the back matter, readers will find a recipe and instructions to cook up your own Tough Cookies. Both a recipe for an edible cookie, and a recipe for a tree ornament. Little Elliot the adorable Elephant is back with Merry Christmas Little Elliot! I just love this little elephant! 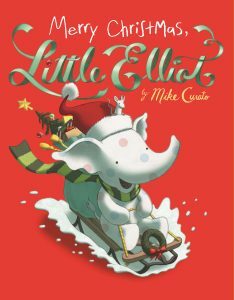 MERRY CHRISTMAS, LITTLE ELLIOT by Mike Curato (Henry Holt and Co. BYR, September 11, 2018, Ages 4-8) Best friends Little Elliot and Mouse go looking for Christmas spirit in this winter holiday picture book. This story is a perfect holiday read-aloud—a modern classic to share! And its theme about the true meaning of Christmas is one that will resonate with all. Scenes of sledding and skating and holiday fun bring lightness to the winter season. No matter where they go or what challenges they face, Little Elliot and Mouse are best friends—forever! This is Little Elliot and Mouse’s fifth adventure together! Fans of the duo will love this holiday special. This next one is perfect for the younger kids! 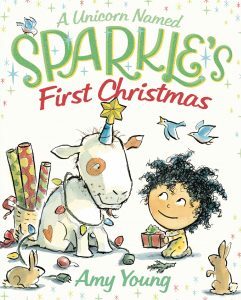 A UNICORN NAMED SPARKLE’S FIRST CHRISTMAS by Amy Young ( Ages 2-6) It’s Sparkle’s first Christmas and Lucy is showing him how to celebrate. In pure Sparkle fashion, nothing goes as planned, but Lucy ends up learning that love— not presents— is what Christmas is all about. Sparkle has so much charisma, just like her peers and fellow beloved MCPG picture book characters like Pout-Pout Fish, Bad Kitty, and Love Monster. Unicorns are an evergreen subject and are especially in style and can be seen everywhere (gifts, clothing, toys, and even Starbucks!). 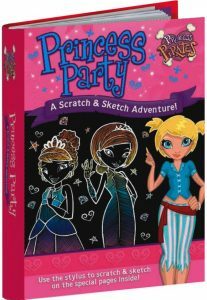 The ethnicity of the main character is not specified, but Lucy has light brown skin and dark curly hair. The first book, A Unicorn Named Sparkle, was an Indie bestseller! This next one is a really cute way to teach young children about voting! 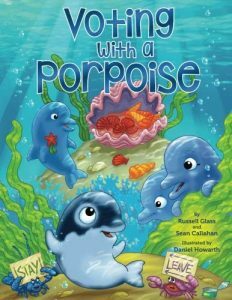 Voting with a Porpoise by Rock the Vote board member Russell Glass and children’s author Sean Callahan. A pod of dolphins can’t find enough food in the reef where they have always lived and are faced with an important decision: stay in their long-time home or move on to more fruitful waters. Looking to the group to vote on what their future would hold, the pod’s leader, Finn, doesn’t want Petey to vote because “he’s just a porpoise.” However, when Finn finds himself with a 6-pack ring wrapped around his beak, which Petey helps him remove, he has a change of heart. With Petey’s vote, the pod swims off for a new reef where they happily find plenty of food and a prosperous new life. This truly is a delightful story and I think that all young children should have this book! This next one is another great gift idea from Dover Crafts! rainbow-colored backgrounds of 16 scratch art pages featuring these heroic characters. There are even drawing and doodle pages. Hardcover with special spiral binding. Retails for $12.99. This one is a lot of fun! Stay tuned! 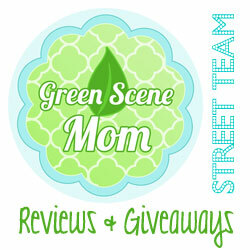 There will be one more Holiday Book Gift Suggestions feature before Christmas! Self Disclosure: I received free samples of the above books and only feature books that I recommend. Images were also provided. No other compensation was received to post.